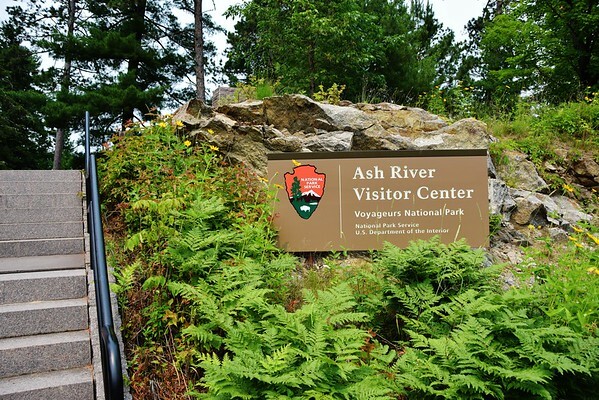 Today we drove the 18 miles to the Ash River Visitors Center at Voyageurs National Park. As part of our usual National Park visitation routine, we watched the park movie. Dean, the park volunteer manning the Visitors Center, said there were reports of bats in the viewing room and there was definitely the distinctive smell of bat guano. Dean then gave us some information about the history of the Visitor Center building. He's a volunteer from South Carolina and was fascinated with our lifestyle. He had more questions for us than we had for him. 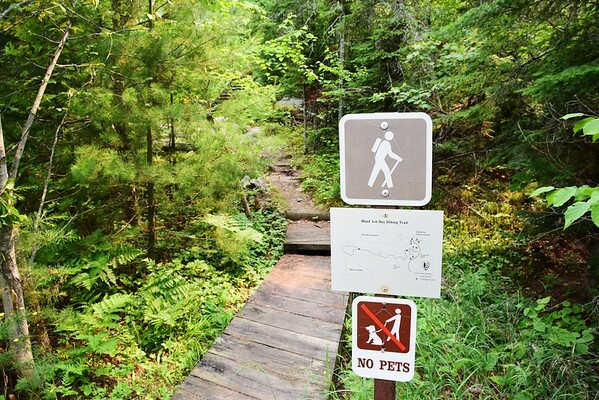 After that, we hiked the Blind Ash Bay Trail, a 2.5-mile trail near the Visitors Center. 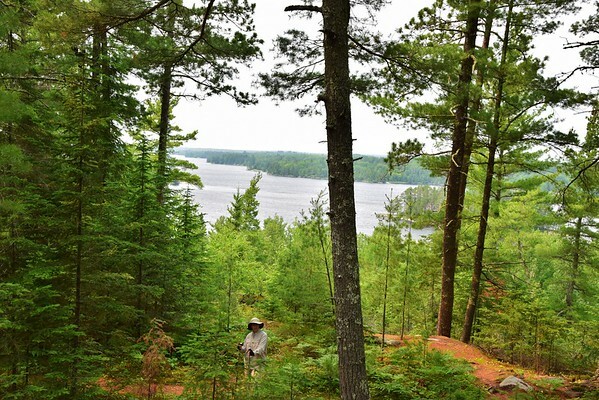 It's a one-mile hike out, and then a .7-mile loop partly along the lakeshore, and then a re-trace of the first mile back to the parking area. 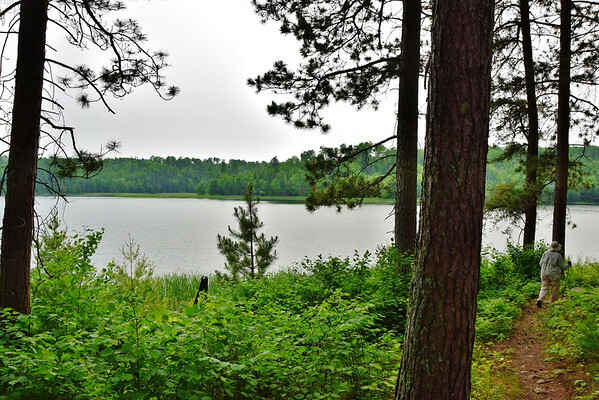 The trail can also be accessed via the Kabetogama Lake Overlook Trail which leads to this partial view of the lake. 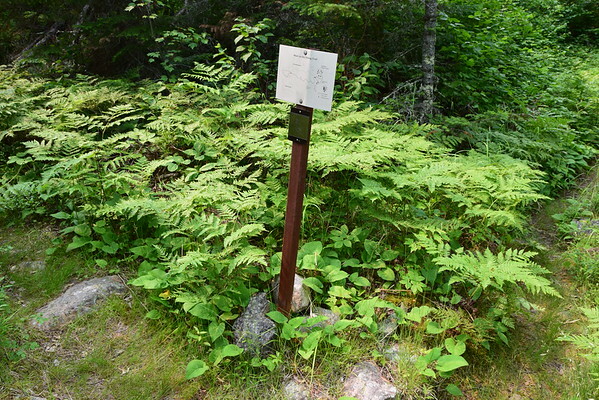 The first mile through the woods is on a narrow trail where the vegetation is overgrowing the path. Long pants are recommended. The trail has lots of roots and rocks, so you have to keep your eyes on your feet. 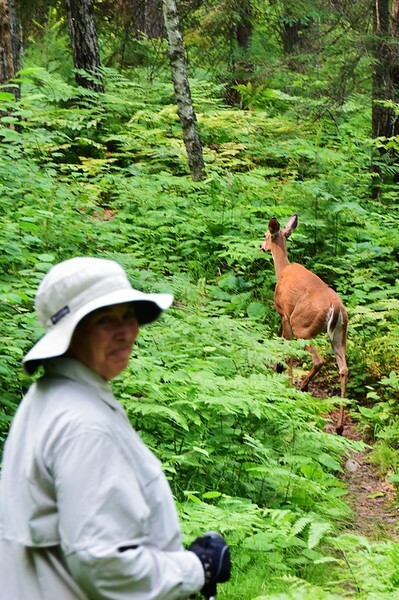 That's why Linda almost didn't see this deer walking out in front of her. Eventually, we reached the intersection where the loop started. We headed to the left and the trail eventually dropped down to the water. 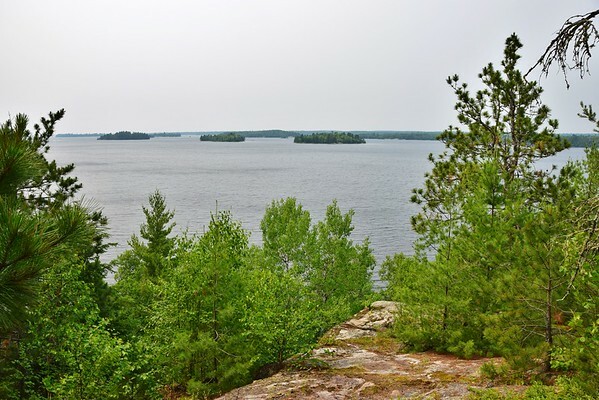 for a short time and then the trail climbed up to an overlook with a view of the main part of Kabetogama Lake. 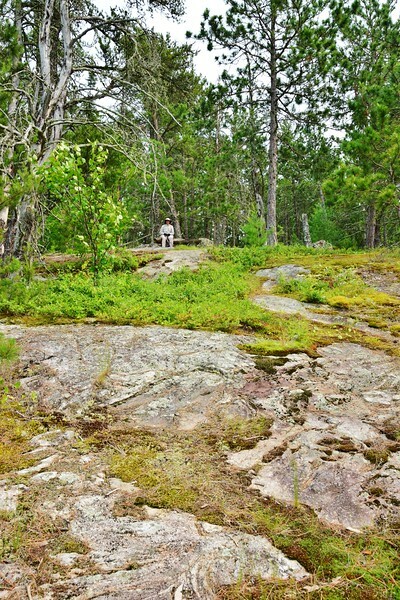 I walked down on the rocks to take a few photos while Linda waited up above on a bench. There wasn't much to the rest of the trail. We saw a small garter snake on the way back, but no other wildlife. 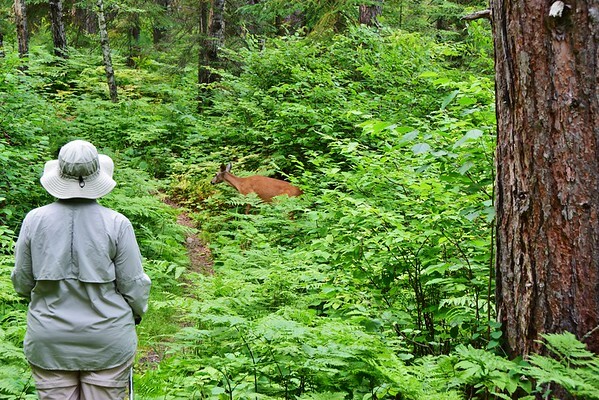 There were a couple of nice views and the deer encounter was cool, but it certainly wasn't a hike comparable to most national park hikes. Having worked a few hours this morning, that little 2.5-mile trail was more tiring than expected. But I still had one tiny trail I wanted to do while in the area. 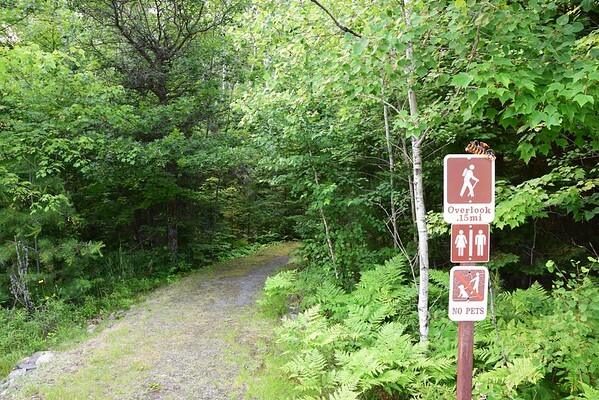 We headed away from the Visitors Center and parked at the Beaver Pond Overlook trailhead. The overlook is only .15-mile from the parking area. 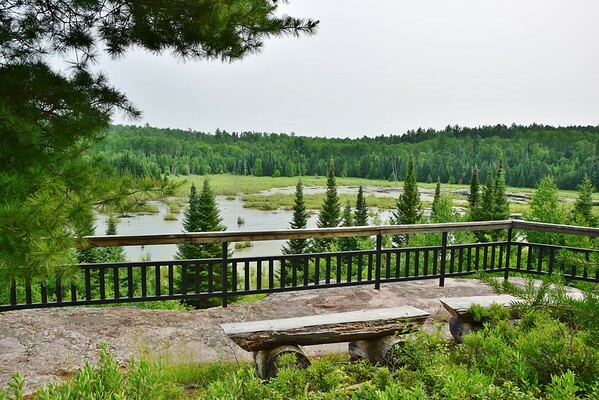 The overlook provides a wide look at a huge beaver pond. Should've brought our binoculars - it's a long distance view. 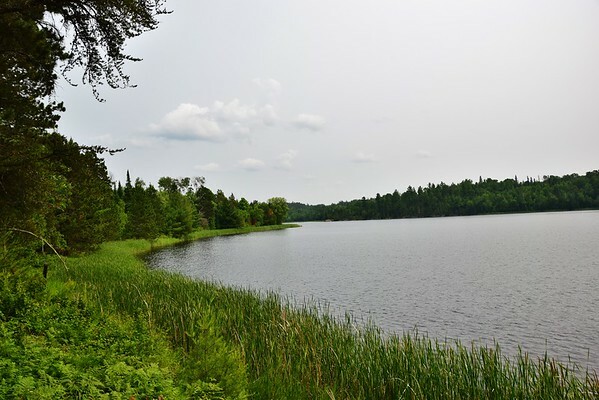 The park website says: "Although beavers are no longer active at this pond, this trail provides great birding opportunities, and the possibility of spotting large wildlife." I'm not sure what they mean by "large wildlife", but it looks like good moose habitat. We didn't see any birds or wildlife and, without our binoculars, we didn't see much point in sitting and waiting. However, for those staying in the Ash River area, it looks like a great place for an early morning visit.